SOUR PATCH KIDS – First they’re sour. Then they’re sweet. 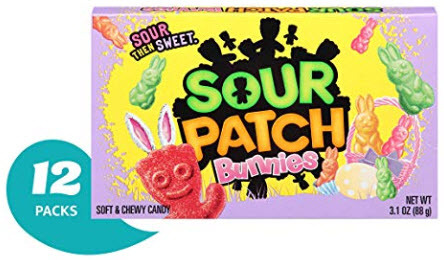 This Easter-themed pack has the same SOUR PATCH KIDS flavors you know and love, only shaped like bunnies. The movie theater-style candy boxes are the perfect basket stuffers for gatherings, Easter baskets, and Easter egg hunts. Keep everyone satisfied when you bring all your favorite SOUR PATCH candies to the party. This bulk candy pack includes twelve 3.1oz theater boxes of SOUR PATCH Bunnies.